With an extensive, professional and successful, workshop, full of specialist equipment, we have the expertise, since1985, and tooling to do every thing from, complete start to finish, guitar building to refinishing and set ups. Customers include band members from The Specials, The Selector, The Enemy, The Primitives, The Dubliners and countless other bands, Guitars or basses built for Graham Kearns (George Micheal), Horace Panter (The Specials), Steve Dullaghan (The Primitives) are just a few of my custom build customers. 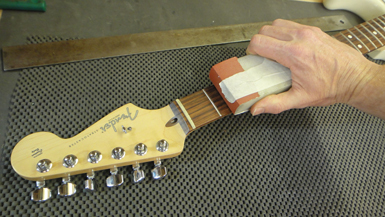 We always do this: level, reprofile and polish frets. 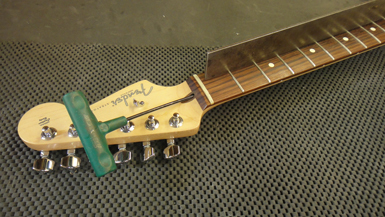 Set top nut string heights, truss rod, action and intonation set. Electrics (pots, sockets and switches) cleaned. Tuning machines and all screws nuts. Pick-up heights set. And lastly but not least, guarantee the work. The cost of a pro set up starts at £59.00 and we can, normally, get your guitar back to you within 48 hours. Extra work and replacement parts not included in the set up will cost more, don’t worry we will quote and get your approval first. Refrets: Electric, Bass and Acoustic guitars. Fret wires used are stainless steel, nickel or phosphor bronze, from a variety of manufacturers. Costs from £180.00, it includes the afore mentioned set up. We always do this: finish in modern thin coating polyester, without a doubt the most durable finish and the thin coating lets the guitar sing. Of coarse we do natural wood, open pore matt finishes too. And we let you chose the colour! For all other work to your acoustic, electric or bass guitar just give us a call or email. The next thing to do is take a look at our custom build guitar page if you haven't already.